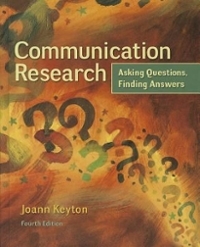 Communication Research: Asking Questions, Finding Answers 4 Edition Communication Research: Asking Questions, Finding Answers covers basic research issues and processes, both quantitative and qualitative, appropriate for communication students with little or no previous research methods experience. The text's guiding principle is that methodological choices are made from one's research questions or hypotheses. This avoids the pitfall in which students learn one methodology or one methodological skill and then force that method to answer all types of questions. Instead of working with one methodology to answer all types of questions, students come away understanding a variety of methods and how to apply them appropriately.